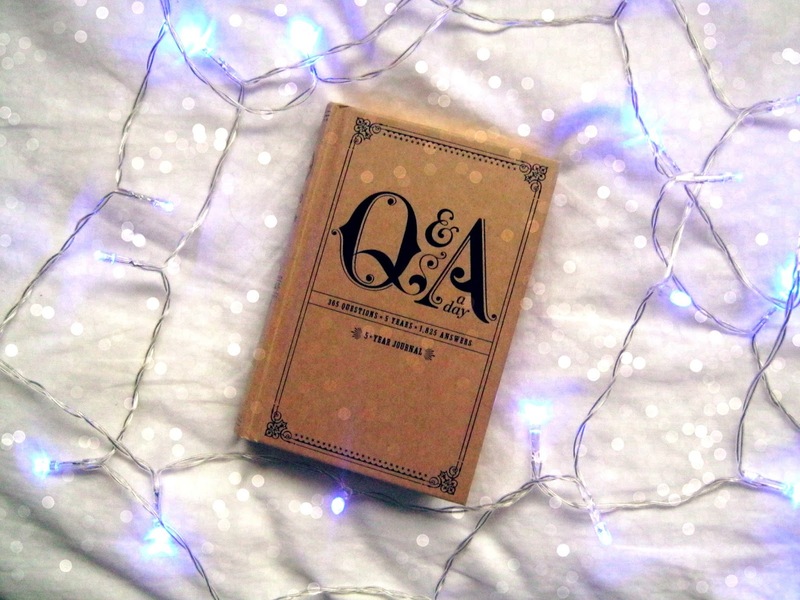 About a year ago everyone was going on about these question a day journals and eventually I did get sucked in, I've always wanted to keep a journal or diary but never seem to be able to keep it up. This handy little journal make things so much easier though, questions are already laid out and if I keep by my bed it just becomes part of my routine. I'm really surprised that a year on I'm still writing in this, gives me hope that I'll still be answering the questions when it comes to the end of the 5 years. I really love the idea of looking back and seeing how your answer differs to previous years which is just what I've started doing as it was a year yesterday since I wrote my first answer in it. I was in hospital at the time and beginning my long recovery from my operation so it makes it even more interesting I think! I thought today it might be nice to share a few snippets of what I've written, I never share my answers with anyone but thought seeing as we are nearly at the end of the year it might help me to look back on what I've achieved and how this year has gone. Also hopefully I can convince you to pick up one of these for yourself, I think everyone should have something like this! I know there are other versions that you can get also, I'm even thinking about picking up a second different one myself, there are lots on Amazon. December 19th 2013: If you could change one thing about today, what would it be? The amount of pain I'm in. ﻿December 29th 2013: What are your top 3 wishes? To recover quickly, pass my AS Levels and for my blog to keep improving and making me happy. January 10th 2014: Write down something that inspired you today. People standing up to online hate. March 5th 2014: What is your favourite word (right now)? Eloquent. March 11th 2014: What was something you wanted today, but couldn't have? A pain free day! April 14th 2014: If you could acquire an talent (without any extra effort), what would it be? I would love to be able to sing well! May 8th 2014: Who do you think is cute? My cats of course. May 14th 2014: What makes a good enemy? Someone really similar to yourself. July 11th 2014: If were a literary character, who would you be? A member of the Weasley family. September 29th 2014: Bad news: sugarcoated or straight-up? Never sugarcoated, always straight-up. October 18th 2014: What famous living person would you want to meet for drinks? David Tennant. October 25th 2014: What is the most honest thing you've said today? I miss you. That's just a small snippet of what I wrote down throughout the year, don't want to share too much! Gives you an idea of just how different the questions are, they reveal a lot about how you were feeling that day but whilst holding small details of what you did that day as well. I'd really recommend this journal to everyone! It would make a great Christmas present as well! It costs about £10 on Amazon. My mum got one of these books but has been terrible at keeping it up. I really want to get one myself and try harder than my mum has, they are so cute! !